If Southfield is new to you, Ann Andrew and her staff will be delighted to offer further information, answer questions or arrange an informal visit. If you have a relation or a friend who is already resident with us, you are welcome at any time, although it’s more convenient if you could avoid meal times. If you would prefer to visit during a meal time and you can give us notice, we can provide you with a meal at a reasonable price. Drinks are available free of charge. Southfield is situated adjacent to Nottcuts Garden Centre, where there is a convenient bus stop and the train stations at Poynton and Bramhall village are not far away. There are easy road links to Bramhall, Poynton ,Wilmslow, Alderley Edge and Prestbury. From the village centre, head south east on Ack Lane East (A5149). 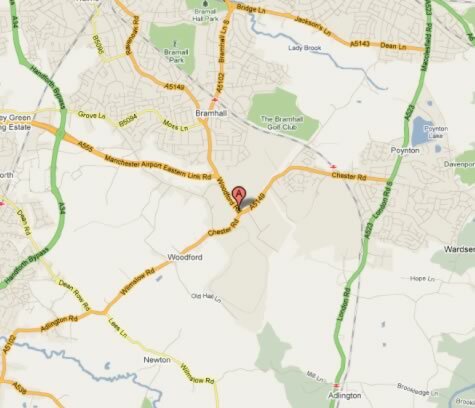 Turn slight right at Woodford Road and, at the roundabout, take the first exit on to Woodford Road. Travel to the end of the road and Southfield is the last house on the right hand side. From the traffic lights in the village centre take the Chester Road (A5149) and follow the road until you reach the roundabout. Take the second exit on to Woodford Road and Southfield is immediately on your left. From Wilmslow station, head north west on Station Road. Turn right on to Manchester Road and at the first roundabout, take the 3rd exit on to the A538. At the next roundabout take the 1st exit on to the Handforth by-pass (A34). Keep on the A34, crossing two more roundabouts and at the next, take the third exit (A555). At the end of this road you will come to another roundabout. Take the 2nd exit on to Woodford Road. Travel to the end of the road and Southfield is the last house on the right hand side. Our policy of sourcing as many ingredients as possible for our wholesome meals from local suppliers has taken on an even closer-to-home dimension in the last year thanks to the creation of new 'raised beds' in our gardens. Southfield is celebrating 30 years as a dedicated residential care home. The house was originally transformed from a family home and developed to care for the elderly in 1985 by then owners David and Marita Blackwell. The couple converted and extended the original 90 year old property in 1992 into a purpose-built care home to tend to the needs of 15 residents. A number of our staff have been with us for many years but we do periodically have vacancies, created through natural progression or expansion.